We don’t get to see a whole lot of trash the dress shoots on Bespoke Bride which is a crime especially if they are all as totally awesome as this one shot by Jon and Joan of BellowBluePhotography. And it all just so happened to be shot in the middle of a super crazy snow storm. This is one not to be missed! “We had the honor of meeting Jeremey and Melissa just two years ago when they contacted us about photographing their unique wedding. We connected with them immediately because they both shared our passion for unique and creative photography. 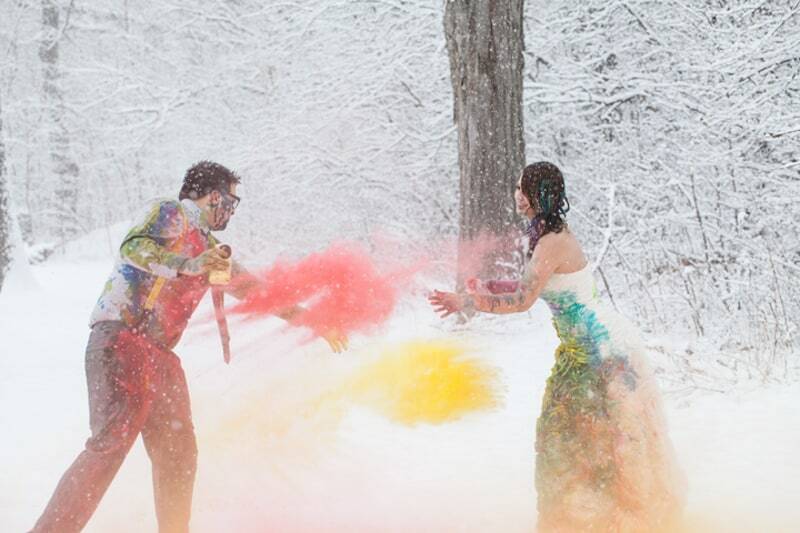 Their engagement session that we did was tea time on a bridge, their wedding was circus themed, and for their day after session they threw, blew, and sprayed each other with paint. A huge thank you to to Joan and Jon and Melissa and Jeremey for sharing this rocking shoot with us today.